Communicators are often too eager to rush in with the solution — the product, service or idea. After all, that’s what we’re selling. But one powerful persuasive technique invites writers to focus on the problem first. If you’re an individual trustee managing trust assets on your own — even if you’re working with a professional investment adviser — you are personally responsible to the trust for the performance of its assets. To protect yourself against a lawsuit and possible damages for poor performance, turn to ABC’s XYZ service. “When you advertise fire extinguishers, open with the flames,” counseled ad man David Ogilvy. Remember: Fire first, fire extinguisher second. 1. Reframe statistics for persuasion. The former is about 20% more dangerous, said a group of college students, according to Paul Slivic, University of Oregon psychologist. In fact, 1,286 out of 10,000 is just a different expression of 12.86%. Writing to persuade? To make statistics more compelling, make them more emotional. When writing about people, use whole numbers instead of percentages. Would you rather meet on Thursday or Friday? Would you like the premium or the deluxe model? Do you prefer package A, B or C? Limit options to a handful: In one study, researcher Sheena Iyengar set up a tasting booth of gourmet jams. When six flavors were offered, 30% of folks who stopped by the booth bought some jam. When there were 24 options, only 3% made a purchase. Too many options can paralyze readers. Don’t cause your audience members to opt out altogether. To persuade people, offer this or that. 3. Have a great IDEA. Whether you’re selling products, services or your company’s new casual dress program, you’ll want to start with getting your readers’ attention and close with a call to action. Start with an interesting fact, anecdote or quote to get audience attention. Make your defining statement, your key message point. Use examples to illustrate and support your message. Request their immediate action. Let readers know what to do with the information you’ve given them. 4. Don’t We-we on your readers. Need. What “go and do” information do they need? Contact information, URLs, maps? Those become your calls to action. Interest. What information do these particular readers want? Consider their demographics and psychographics. Are they mostly .coms, .orgs or .edus? Curiosity. Human interest, narrative drama, suspense and other creative elements appeal to all readers and make even the most boring topics more interesting. Ask “who?” Who’s your target audience? Who will be reading, watching or listening to this message? When my bookkeeper asked me recently to bring a bag full of business documents over, I put the bag on the bench by my front door so I’d see it on my way out. After forgetting the bag twice, I laced my purse straps through the bag handles. The act of untangling my purse finally reminded me to carry the bag to the car. That’s why your vitamins are on the shelf in front of your cereal box. It’s why your take-at-bedtime prescription is on your bedside table next to your reading glasses. Environmental triggers move you to act. You can also use them to move audience members to act. Take out your phone right now and look at the last text message you got. Read it out loud. Is that text worth causing an accident? What persuasive writing techniques do you use to bring readers around to your point of view? Please share in the comments section below. 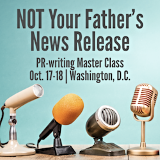 But at Catch Your Readers — our two-day persuasive-writing workshop on April 10-11, 2019, in Charleston — you’ll learn a four-step process for moving readers to act by giving them what they really want.